Our business model is different from those of foam companies'. It's not about selling you a new bag and a bunch of foam every time you get a new army or back a KickStarter project. We don't believe in planned obsolescence, though nowadays so many companies are banking on their products becoming useless over time just to sell you more stuff. You get a system you can use however long you want, with whatever models you want. It's intended to serve you a long time (you'll notice that the Trailblazer case comes with a lifetime warranty). Use it wisely, and you won't need anything else again. The elegant design and high quality materials used to make ShapeShift trays means that you won't feel ashamed to keep them in your living room - unlike foam trays, which need to be stored in a bag so they don't look like trash. You'll notice our products are pricier than foam systems and we believe that's fair. We're not here to sell you stuff several times a year. ShapeShift products can be reused with whatever miniatures you already have, as well as future purchases from almost any manufacturer. They will adjust to your interests. But there's also another factor. Our trays require far more work to manufacture versus cutting some slots in a sheet of foam. 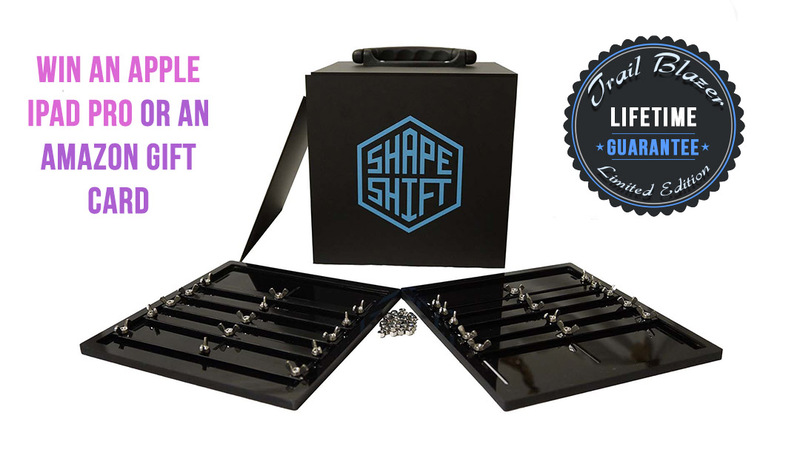 Each ShapeShift tray is assembled from two machined sheets of black acrylic and contains 14 precisely cut rubber strips, glued along each profiled edge. All the edges were routed and sanded smooth to remove excess glue. Each tray also comes with a set of 15 steel fasteners. You can also freely combine base sizes in separate rows, and add other, non-standard base sizes. The adjustment is completely fluid, so it's up to you how you position your miniature. Note that it doesn't matter if you bases are square, round, rectangular, hexagonal or oval. They will all fit, as long as they're not taller than 5mm. Each tray is valued at 30€ or 30$, and that amount includes a full set - tray, 5 sliders and a set of fasteners. Is that expensive? Considering that a sheet of foam can easily cost you 10$ (some will be cheaper, but a sheet for a 120mm model will be far more expensive) and will only fit the models it was designed to carry, and the bag it was intended to be carried in, let's do some math using the table above. To get the same functionality from a foam system as you do from just one ShapeShift tray, you'd need to spend around 10$ for each base size listed: 6x10=60$, not counting the vast amount of combinations that give you maximum efficiency of space. That makes foam twice as expensive before we even get into cases and bags for it, and discounting all the combinations you might need. "I need a bag for this system, for that army, and look! A KickStarter game! Guess I'll need a new bag for that as well..." This is how you end up paying a "foam tax" for each new miniature you buy. It's a kind of pay to play system, and a neat business model. But for the player, doesn't it make more sense to just get a product that will adjust to fit all your models and pay only once? You can decide for yourself while browsing the offers below. Ideal for skirmish games and medium battles when you know in advance what you're going to play. The Trailblazer case was designed to look good and comes with two trays you can put in three different slots to optimize space for taller models. The overall dimensions form a roughly 240mm cube (that's around 9.5 inches). All those cases were machined and glued by hand, and it was so much work I'll never do it again. I'm serious! 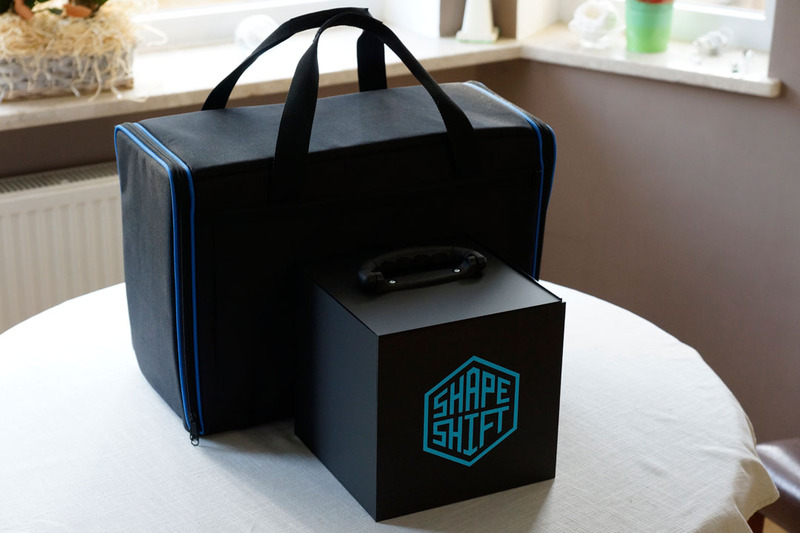 This is a limited edition that comes with a hand-numbered owner's certificate, an instruction brochure, two sets of stainless steel fasteners and a blue microfibre cloth with the ShapeShift logo on it. The luxurious case is made of matte black acrylic which will get your trays safely to the store. It will also easily fit within the allowable carry-on luggage dimensions in any airline. The case will do fine for normal use, but don't expect it to withstand the same punishment as a foam bag! Bumps are fine, throwing it around definitely isn't. To eliminate any risks you might encounter (over-enthusiastic pets, clumsy gaming buddies, & co.) I am offering a special lifetime warranty​ for Trailblazer cases. If, at any point during your use of the case it becomes damaged to the point of losing its functionality, I will send you a replacement of the equivalent size free of charge. I'm shouldering all the risk so that you will never lose the benefits you get with your purchase. Each Trailblazer hand-signed certificate gives you a chance to win a brand new Apple iPad Pro with a 9.7" screen. When all the limited edition Trailblazer sets are sold out, you'll receive an email with a notification. I will then set a date for a live stream during which I will randomly select a winning number. The person with the certificate that has the number on it will get a 9.7" 128 GB Apple iPad Pro shipped to their door directly from a store of my choosing. In addition, two runner ups will be drawn, each receiving a virtual Amazon gift card worth $75 USD or the equivalent in local currency.​ Remember, the lottery will take place after all the sets are sold, not sooner! Note: The US Dollar value is roughly 165 USD at current exchange rates. All transactions in our store are actually processed in Euros, hence your final price in Dollars might differ slightly from the one shown here. 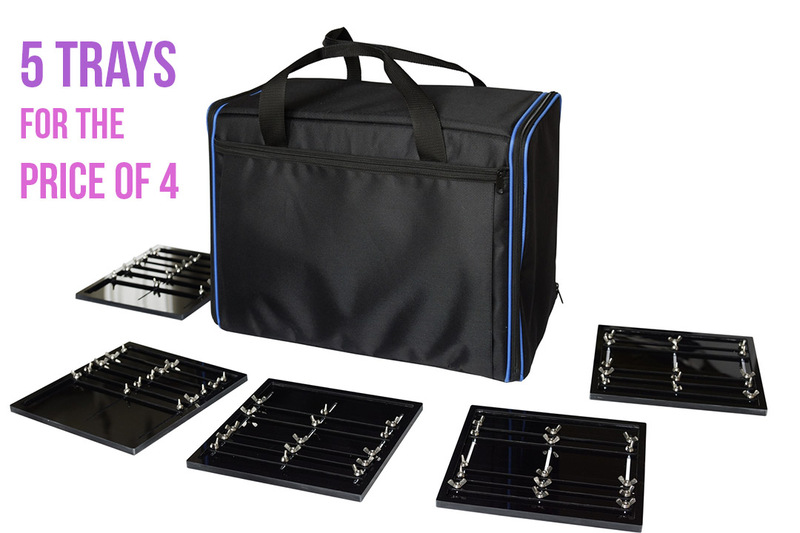 This offer is for a bag that can hold up to 20 empty trays, and comes equipped with four. 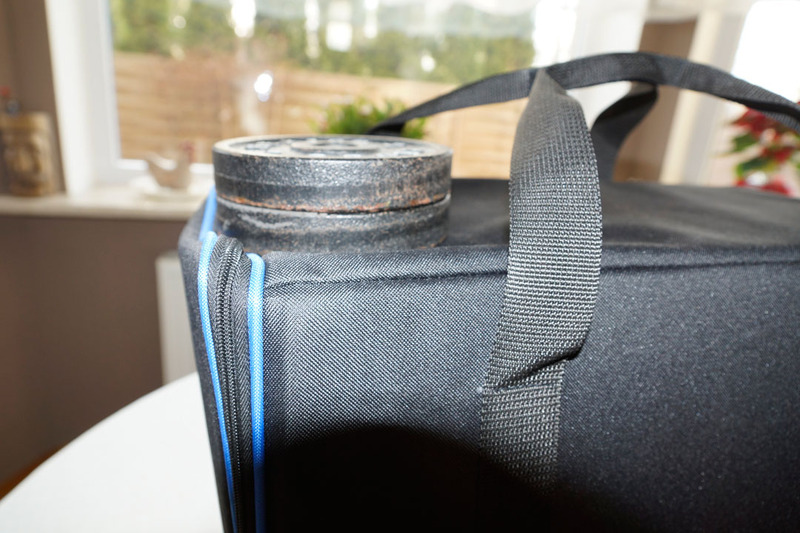 It's almost 2,5 times larger than the Trailblazer case: 50cm long, 40cm tall and 25cm wide. That's around 20x15x10 inches. The Overlord combines the space-saving efficiency of the ShapeShift system with a boatload of space that should really let you go to town. Or to the store. Or to a tournament. A size comparison with the Trailblazer case. Note: the pictures you can see here show a prototype, which is incomplete. The bag is already specced and scheduled for production, with first units arriving in May. Click on the bar below to see the features. The interior is divided into two sections, and each has slots for trays spaced 3cm apart along the side walls. As a result, you can adjust the height of your trays to your heart's content. On one side, there is a large pocket with a zipper (a matching blue ShapeShift logo will be located there). You can fit your rulebooks, tablets, dice, templates, tokens, cards and other widgets in there. Here's a whole bunch of stuff I managed to fit in the side pocket. The laptop was simply a case of "how far can I take this". 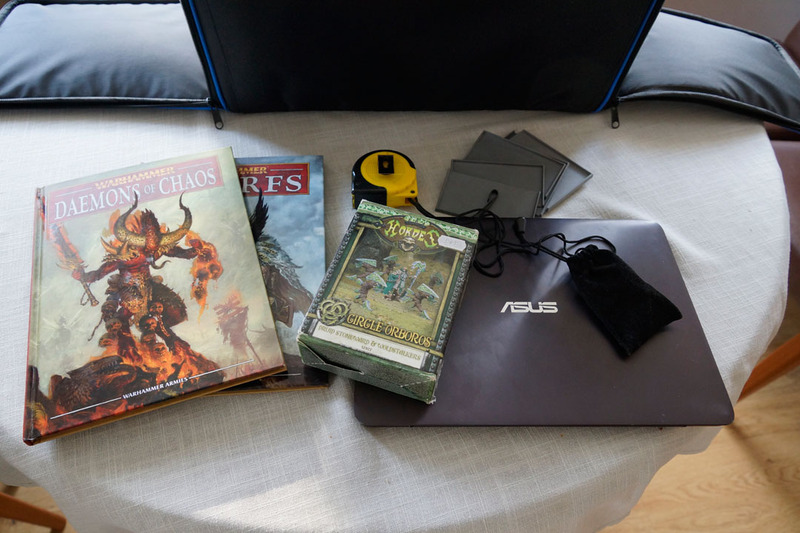 Naturally, this is not a realistic representation of what I usually take to games (like, Warhammer? What's that grandpa?). And here's all of the stuff you saw above in the pocket. For added protection, the bag is lined with hard foam on all sides and it's reinforced to prevent the walls from collapsing on your models. It comes with an adjustable (duh!) shoulder strap and handles. Here's a ShapeShift product that will tank some damage before your minis get hurt! 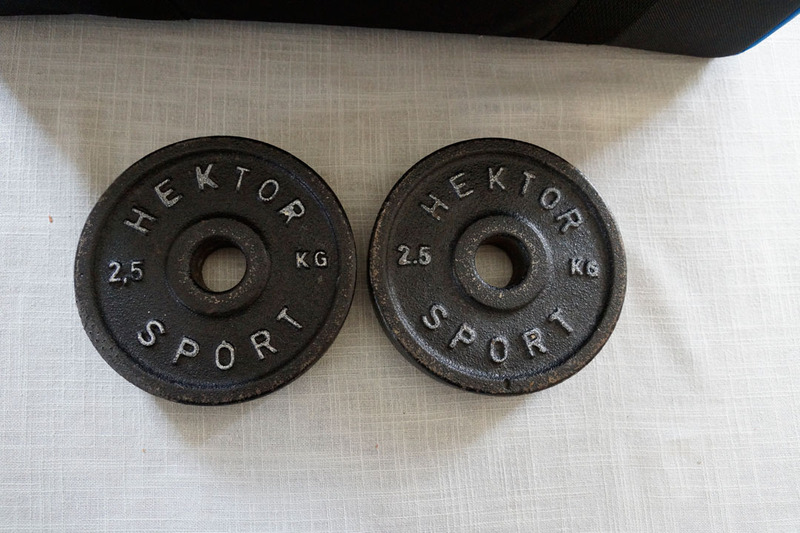 I conducted an unorthodox test on the prototype with my old dumbbell plates, to test the stiffness of the bag. For American readers, Google informs me that they weigh a bit over 11 pounds combined. I put them on the weakest spot where the walls meet the zip door. As you can see, they had barely any effect. 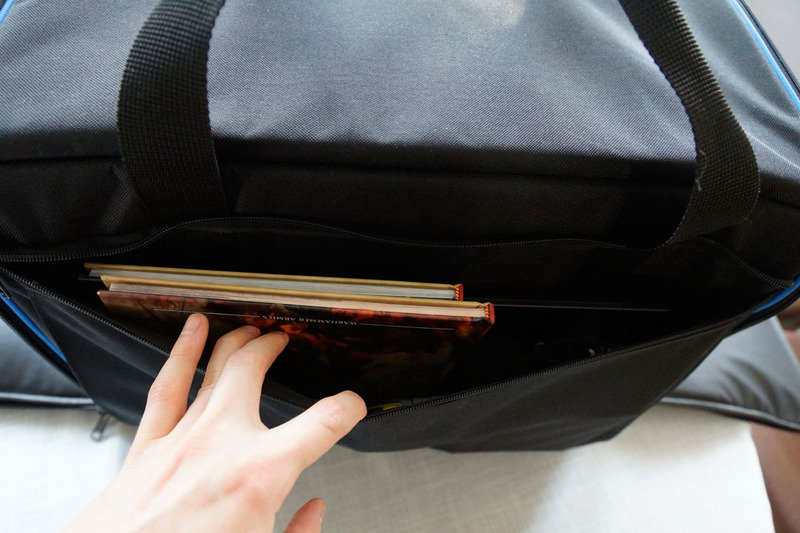 Test passed with flying colours - this bag won't cave in on your minis. Of course, since this is a foam-lined bag it's much more impact resistant than the Trailblazer case. You get solid shock-proofing, not just static load bearing. Note that these are minis from two different factions, plus some Deadzone models I had on one tray. 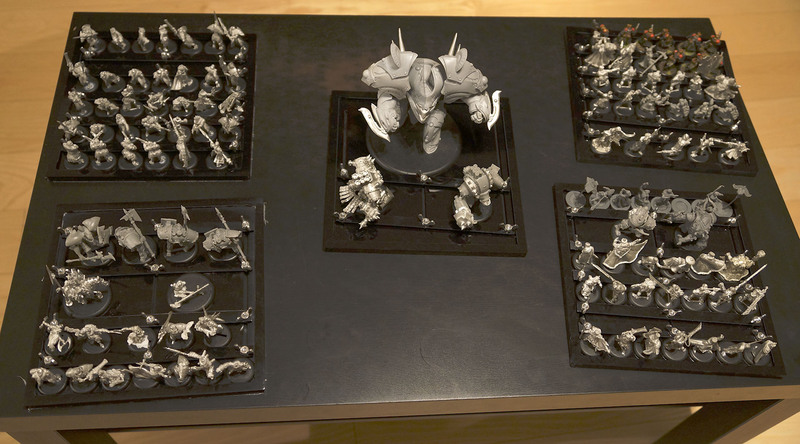 There are few scenarios in which a player would need more miniatures than the amount that can easily fit on five ShapeShift trays. And the three remaining trays fit easily in the other half of the bag. 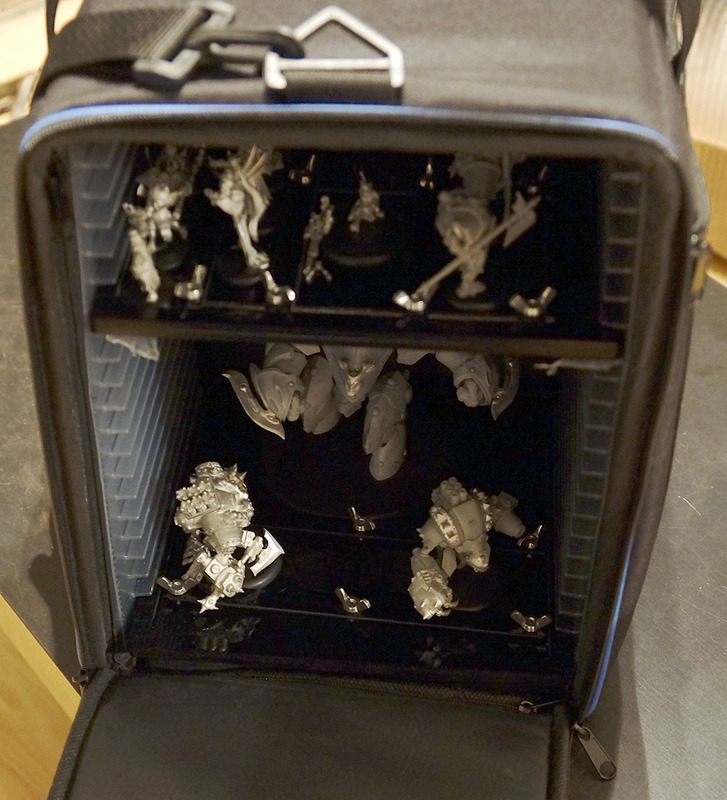 And here's a shot of the bag on the same coffee table with all the minis inside and ready to go. This offer is a pre-order. The bag will be available for shipping in May. It will be dispatched on a first come, first serve basis. In other words, people who order now will get their bags first. ​I will sign up everyone who pre-orders on a special mailing list and send you progress updates and specific dates, so that you know when to expect your parcel. You can easily withdraw your pre-order at any time before the bag is released. I'll refund your money through PayPal. Simply send me an email stating that you're opting out and you'll get a full refund. After you get the bag, you're protected by our no-questions-asked money back guarantee (see bottom of page). 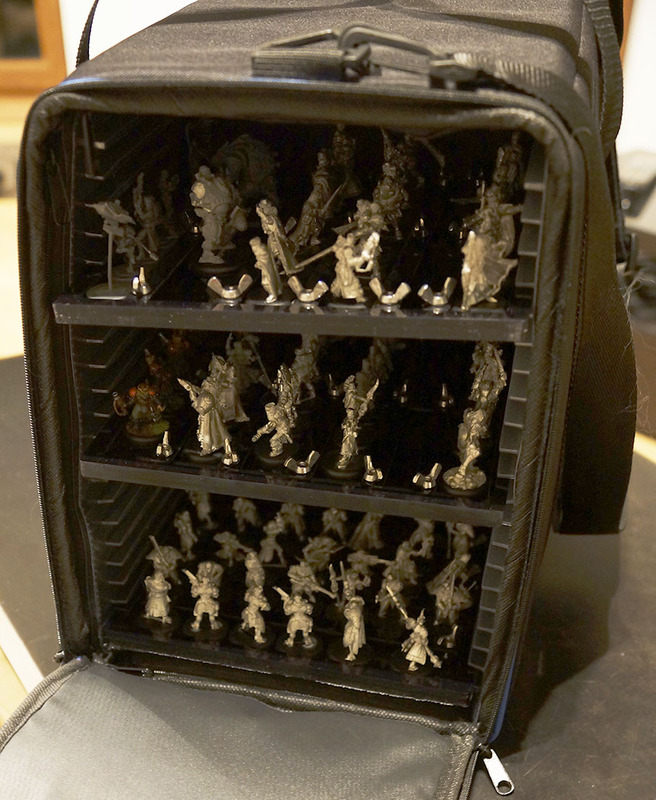 The players I designed this bag for need to be able to take as many models to a game as they want. If you're one of them, here's a generous, limited-time, "early bird" offer: pre-order Overlord and get 5 trays instead of 4. That translates to 25% more miniatures you can put in your bag. When the bag becomes available for regular purchase, the set will include "only" 4 trays for the same price. This represents an extra 47 US Dollars or 54 Euros of miniature-carrying value! You might expect that at 2,5 times the capacity, an added pocket and twice the number of trays, Overlord will be at least twice as expensive as Trailblazer: 300 Euros or 260 US dollars. Not so. The price is significantly lower: only 219 Euros or 189 US Dollars for the whole package. Note: The US Dollar value is roughly 243 USD calculated using current USD/EUR exchange rates. All transactions in our store are actually processed in Euros, hence your final price in Dollars might differ slightly from the one shown here. We only accept pre-orders through PayPal. ​Note: there is no lottery tied to the Overlord pre-order offer. The iPad and Amazon gift coupons are limited to the Trailblazer case, available with offers 1 & 3. - To sweeten the deal, combine the shipping on both items into one large package, instead of paying twice for the case and the bag. 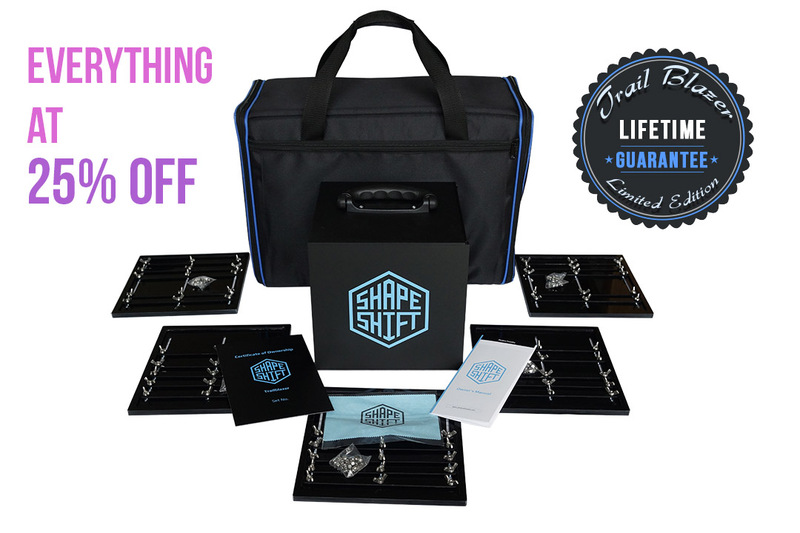 This deal nets you the Trailblazer case, the Overlord bag and 5 ShapeShift trays. All for 289 Euros or 259 US Dollars plus shipping. Your purchase becomes a pre-order, to combine the shipping on both items into one parcel once the bag is ready. At roughly 25% off compared to ordering separately, the two-in-one shipping and all the bonuses, this is by far the best offer you can get. Note: If all the Trailblazer cases sell before you get your parcel, you will receive your certificate number via email for the purposes of the lottery. Note: The US Dollar value is roughly 321 USD, calculated using current USD/EUR exchange rates. All transactions are actually processed in Euros, hence your final price in Dollars might differ slightly from the one shown here. Or call me directly on Skype: +48530306578 between Monday and Friday 8 AM - 5 PM Central European Time. We use ground shipping by courier (DPD, UPS, DHL) in Europe for a delivery time of around 4 days. Outside of the EU, we offer economic postal parcels or airmail (FedEx). It's your choice if you want to get your purchase as soon as possible or whether you prefer to wait a bit longer and save your money. Please note that delivery times for postal parcels are not guaranteed by the service provider. All purchases you make here are subject to a no-questions-asked money back guarantee that's good for 14 days after you get your parcel. That way you have two weeks to decide if you want to keep your purchase. Whatever your reason for the return, just write to us, send the product back and you'll be issued a full refund via PayPal or directly to your bank account if you paid by Credit Card (whichever payment method you used to make the purchase).